The oil sector is close to breaking a record. In February, I showed you that oil inventories were soaring. They had just reached their highest level ever. You see, despite oil prices being down almost 60% since their June peak, oil production is still outpacing demand. [ad#Google Adsense 336×280-IA]That means the amount of oil in storage continues to soar. In April, inventories hit a new all-time high – at 491 million barrels. Inventories fell during the summer months as folks took advantage of low gas prices. They fell for eight straight weeks from the end of April to the end of June. But with summer vacations now over, they’re rising again. Inventories have increased for the past seven weeks. More oil in storage might be bad news for oil prices… but it’s good for the companies that generate a large portion of their profits from storing oil. I told you about four of these companies in my February essay. Since the fourth quarter of last year, all of their quarterly earnings before interest, taxes, depreciation, and amortization (EBITDA) are higher. These companies are also master limited partnerships (MLPs) – which means they’re obligated to return nearly all of their income to investors in exchange for certain tax benefits. So they all have high yields. Holly Energy (HEP) generates its sales from its pipelines and storage assets. The company’s primary revenue growth in the third quarter came from its crude-oil pipelines. Shipments were up 49% over the prior year’s quarter. Holly Energy also stored 9% more barrels of crude- and refined-oil products at its terminals. Thanks to this growth, shares of Holly Energy are up around 8% (with dividends) since my February essay. This might not sound like much, but the average MLP in the benchmark Alerian MLP Index is down 20% during this time. Holly Energy is also focused on growing its distributions (which are like dividends). Shares yield 6.6% right now. Since the company went public in 2004, it has grown its distributions by 155%. Management’s goal is to grow its distributions at least 8% per year. Despite its growth and high yield, Holly Energy’s valuation is about the same as it was in February. Its enterprise-value-to-EBITDA ratio today is 13.1 versus 12.5 in February. The lower this ratio, the cheaper a company is. 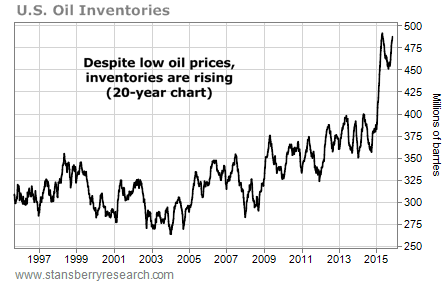 In short, the trend is up in oil inventories. And Holly Energy will continue to be a big beneficiary. I recommend looking into units today.